Well, my fellow homesteaders, we had quite an unusual and interesting weekend here on Serendipity Acres. Some many things happened I barely know where to begin. On Friday evening I was headed out to the barn for put up like I do every night before dusk. I stopped at the gate before the pond and attempted to lean over and unlatch it without getting off the wheeler. This would have worked great, but Pearl and her kid, Rooster were hanging out by my herb beds trying to steal a snack. Now, every night at put up all of my critters get a healthy snack. They like the yummy routine and are blissfully unaware that I use the nightly treat as a way to pump natural herbal supplements or homemade natural medicines into them. Pearl, ever the impatient female who is quite spry with just her three good legs, did not want to wait until I opened the gate, drove through it, and then onto the barn before getting her nightly put up snack. She and Rooster not only jumped onto the side of the wheeler, but up onto it with me still in the driver’s seat. This is Pearl’s, “Do you have a snack for me, my queen…you had better have a snack for me,” look. We have gotten used to her one ear look now and the loss of the ear has not seemed to decrease her hearing at all. At first ,this made me smile. Seeing my Pearly goat be able to hop up onto the wheeler like she used to, before a dog attack destroyed the use of one of her legs, reassured me that she was indeed back to her old self. We decided, at least for now, to not have her leg amputated. She has no walking use of it, but since it is not causing her pain and has healed over with a thin layer of hide all but in one spot, she uses it for balance when kneeling and climbing and I didn’t want to take that away from her unless it was absolutely necessary for her health. 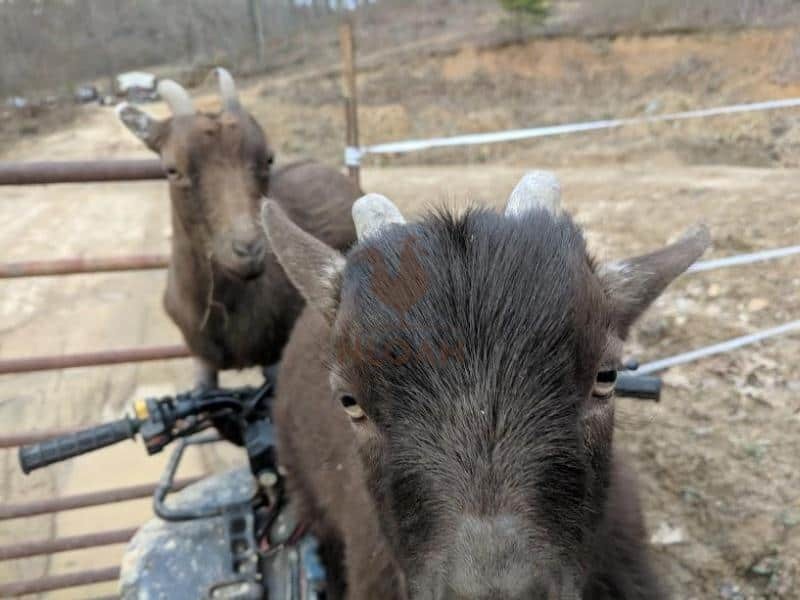 Then, both goats jumped up onto the 4-wheeler with me. There was no room for them and me, but they didn’t seem to care about that important little fact. They nosed around looking for the put up treat bag. Since it was raining, I had the bag tucked into my coat. I didn’t think they would notice, that their sense of smell was not that great. I was wrong. 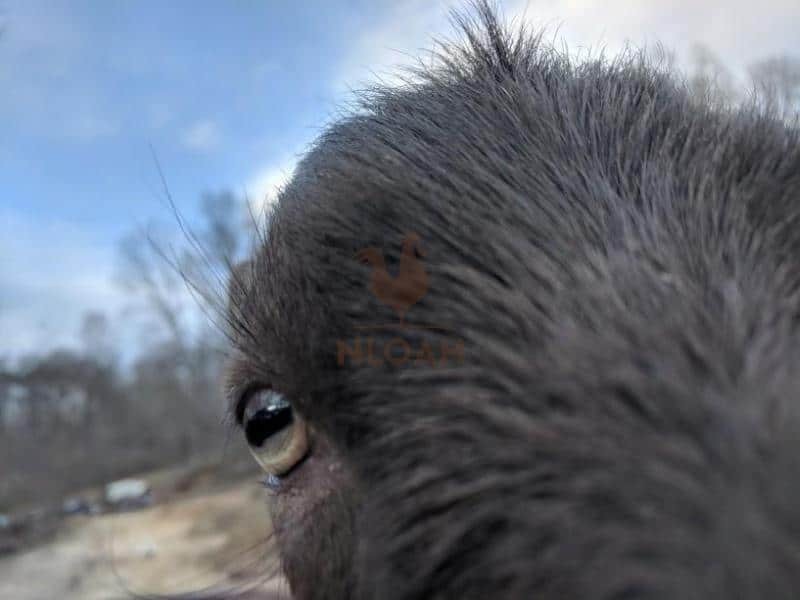 I snapped this goat selfie when Rooster was trying to get into my coat to taste what was on the menu for snack that evening. Thankfully I only wash my barn coat on Saturdays because his hooves were covered in mud. 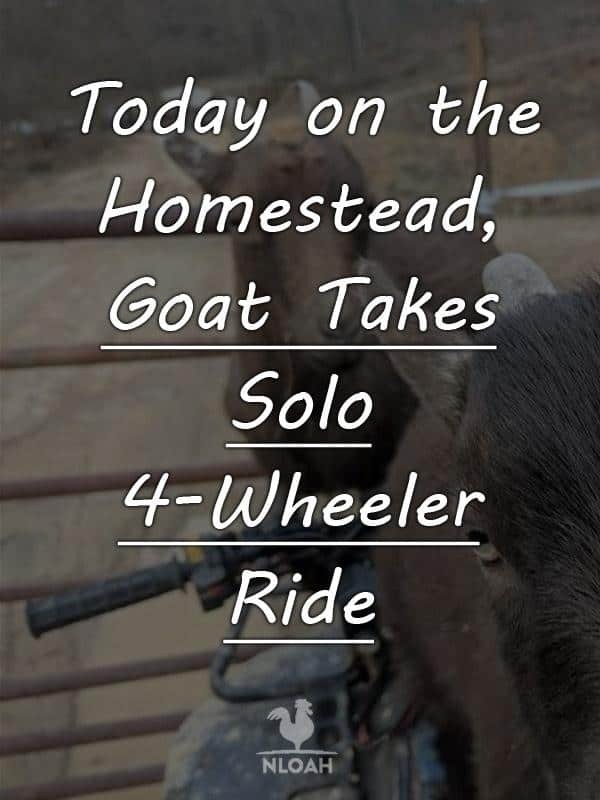 Alright, fellow homesteaders, I am convincing myself it was just mud on his hooves and not a combo of goat, horse, donkey, pony, chicken, duck, and guinea manure. My blue heeler, Jovie, was not happy about the goats climbing all over her girl and delaying the post-put up jaunt around the homestead. I put the wheeler in gear after finally reaching around the goats by leaning over them and standing up on the wheeler. As I slowly rolled through the gate, Pearl jumped off but Rooster rode on my lap until I stopped again. Once through the gate, I had to hop off the wheeler and shut the gate. I parked on what passes for level ground around here – leaving the wheeler in neutral and running. I have done this literally a hundred times, if not more. When I got off the wheeler and walked towards the gate, Pearl jumped back on the front of the 4-wheeler. I laughed again and kept walking. Then paused and wondered if Pearl’s slight bulk would cause the wheeler to roll from the level-ish spot where I had parked it. I didn’t figure she could. Wrong…again. This is the same spot on the wheeler that Pearl jumped back onto after I had driven through the gate. If she had stayed put there until I got the gate latched, all would have been well. But, being an impatient female much like myself, she did not. When Pearl jumped over the handlebars on her three good legs, she jarred them, turning them towards the left. To right of the wheler was the pond, definitely not a good place for the wheeler to roll, not even though it was parked across from the extremely shallow end. To the left of the wheeler was even more problematic. A muddy and deep culvert filled part way up with water led straight downhill to an even more deep ravine. If the wheeler rolled and hit a tree, it would be fine. The metal grate on the front, bent now slightly in front of the wench after going over the ravine and flipping upside down (my daughter riding too fast in too high of a gear in mud around a corner incident last year. Thankfully she jumped off just inches before it went over the “cliff.” At 22, she was too old to spank but I haven’t let her drive my wheeler since!) could have sustained a roll into a tree unscathed. I glanced back just to make sure the wheeler and Pearl were fine as I started to latch the gate and saw it rolling – goat now in the driver’s seat, straight toward the steep culvert. I ran as fast as I could to reach the wheeler. I couldn’t hop on without shoving the still recovering Pearl off forcefully, so I essentially punched the handlebars when I got close enough to finally barely reach them. Yep, I sent the wheeler straight toward the pond. Pearl jumped off the wheeler at this point so I hopped, rear-end first, onto the driver’s seat and grabbed the handlebar brake to stop the wheeler. This break does not work as well as the foot brake beneath it that I could not reach at the time, but it slowed the wheeler’s roll down enough to give me time to swing my leg over and stomp on the good break. Pearl and Rooster were left nonplussed by the entire ordeal. Jovie was barking her head off the entire time but eventually calmed down and we all continued on to the barn for put up and snack – which was now squished significantly inside my already dirty barn coat. On Saturday we dealt with more flood issues. Living on the top of a wooded hill so high you can nearly reach up and touch helicopters when they fly over on emergency calls you would not think we have to worry about flooding, but this winter and early spring we sure have. 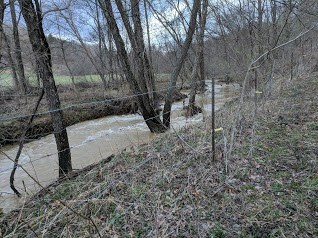 When I took a photo of our misbehaving creek before going to pick up the tractor mechanic on the other side my husband had asked me to get because he only has a small pick-up truck, our rural cell service had a great delay in delivering it. I didn’t know it at the time, but he was out on the second of two water rescue calls when I drove our Dodge across the creek. Water came halfway up the doors and it’s a tall truck. It covered the hood like it was a surfboard. But, I got across the creek as Pat and his two helpers were pulling in. They had been there and left to catch a cell signal to tell Bobby the creek was too high to cross period and to let me know. Not being able to reach either one of us, they came back. One of the boys measured the creek at a spot safe enough to reach and it was 4 feet deep. They couldn’t believe I crossed it and didn’t want to go back over it. I had to go back over either way and told them I could do it again and get it. As I inched closer to the creek, I was secretly wishing Bobby was the one driving across it, but was not about to admit that.. One of the boys said I gave him a heart attack, but we made it back across. It had already stopped raining, for the day at least, so by the time their work was done it was just high and not “Oh, heck no high” when they left. 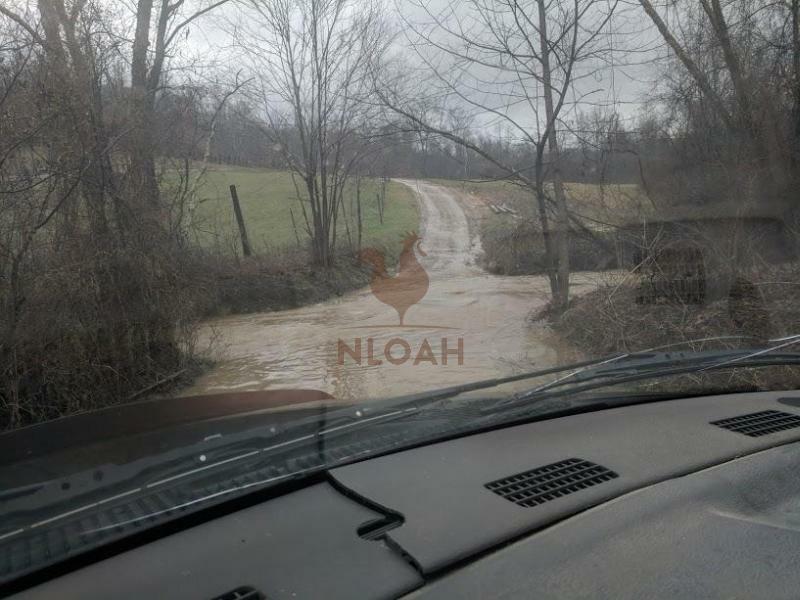 All of the historic precipitation in our region, the whole state really, has caused road cave-ins, flooding, and multiple electrical outages. Because our homestead is also a survival homesteading retreat, we carried on as pretty much normal throughout the series of events that were highly problematic for others. 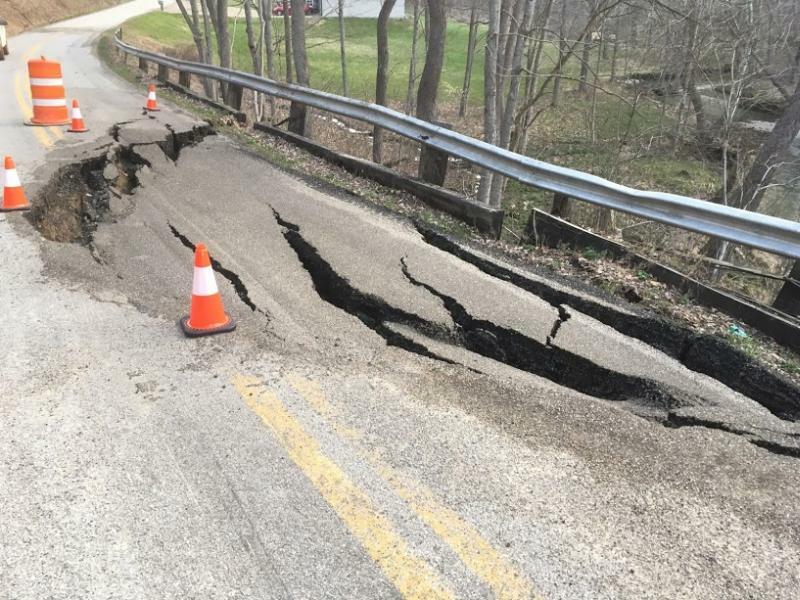 This road cave-in happened just past our driveway. It was smaller than that at first but is larger now. Originally the county said it would take just a couple of days to fix. Then yet more rain came and the hole grew, so it is hard to tell how long the shortest route to town will be closed. I was in the middle of some embroidery projects that will be sold to generate more homesteading-based income during one of the power outages. Thanks to our whole-house enabled but not yet connected generator, I could plug in my embroidery machine and continue on by lamp oil light. It would have been a cool Little House on the Prairie moment, but the generator also kept the satellite internet and Dish running, so I can’t really say we were roughing it too much. On Sunday, I had hoped for a day of complete relaxation while sewing and embroidering. Being a homestead, y’all already know that didn’t happen. Guinea Carol, the only survivor of our original guinea flock, has something really weird going on with her feet. It is not bumblefoot. I did some online sleuthing to see if anyone other guinea keepers had experienced a guinea who has swollen toes and no visible claws. The same condition has happened to other guineas, and none of the other keepers were really sure what it was either, after also determining it was not bumblefoot. Because all of our animals free range, we have not suffered any of the common ailments most herd and flock keepers struggle with. The animals live naturally and are never crowded together in confined spaces, so the readily spreading of bacteria and disease simply do not occur. This swollen guinea toe issue still remains a mystery, and I am using common sense and natural medicines to bring the swelling down. There is no cut, blood, or infection coming out of the swollen toes, which are on both feet but more obvious on the right foot. She is walking, eating, etc. just fine – but with a bit of a waddle. Have you ever tried to catch a guinea and convinced them a soak in Epsom salts was in their best interest? It is not for the faint of heart, trust me. The swelling appears to be coming down, but it is definitely not gone. I am hoping to find out more about the condition after the area livestock vet looks at the photos of her swollen toes and issues some guidance or makes a farm call to check her out. On Sunday, which is supposed to be a day of rest for all, I am sure I broke at least a few child labor laws. The kiddos thought they were just having fun and earned quarters for their efforts, so it’s all good. Training the children up in the way you want them to go, while infusing them with entry level homesteading skills is a good thing, at least in my book. 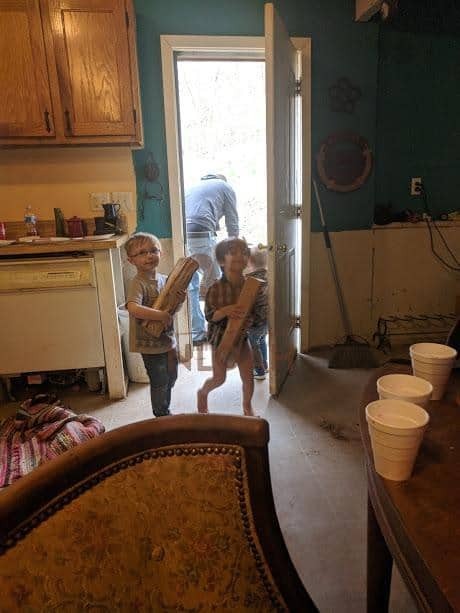 Our youngest grandson, Colt, and his buddy Jaedyn (who was so proudly displaying his new glasses) along with our granddaughter Auddie and Jaedyn’s little brother, Garrett, toted two wagon loads of wood to the box. Bobby had to do some restacking, but the kiddos packed all but a few really large pieces of firewood. The most awesome part of this is that I didn’t even need to ask Colt and Auddie to help with the chore. When the back door opened and they saw the wagon full of wood, they instinctively went to lend a hand and their friends followed suit. Both have helped unload wood quite a few times before, but this time, they worked until the wagon was empty. Showing off how big they are in front of their pals? Maybe, but it worked for me and I told them Grammie and Pap expect the same level of service next time! I will share some more details about getting a home-based embroidery business off the ground and how little money it has cost to turn a fun hobby into a nice homestead income booster in my next article. But for now, I can once again beam with pride of having helpful homesteading grandkiddos. Winding bobbins seems like a never-ending part of embroidery. It takes a whole bobbin with man patterns that are more than just an outline fill. To reduce the frustrations that come from constantly having to stop and rethread the machine to wind a bobbin, I wind them six or eight at a time. Colt took a break from playing with the homemade barn ($5 yard sale kitchen cabine we turned into a barn his first Christmas) to come check out what Grammie was doing at her crafting table. He loves machines. He wants to figure how they work, work them, and probably, if he is anything like his Papaw, take them apart to investigate further. Colt and Auddie often embroider. I tell them what buttons to push to make the high-tech machine work and use it as a comprehension and color matching little educational lesson. This Sunday I decided to expand on the lesson and show him how to wind bobbins. 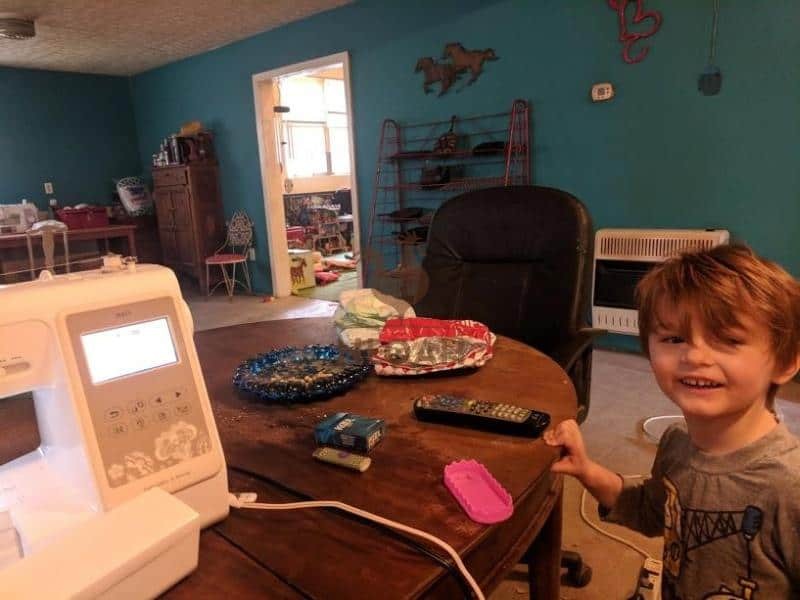 Colt is all boy and I highly doubt he will take up sewing as a hobby, but I still think furthering his interest in how machines work is a superb idea and yet another example of teaching homesteading skills early. I showed Colt where to place the empty bobbin on the machine and how to plug the foot pedal into the machine. I told him he had to wait for the next step until I threaded the bobbin. He did. Then I showed him how to step on the pedal to make it work and told him to remove his foot when I said stop because that meant the bobbin was full. He watched with excitement as he wound the bobbin with his little foot. After telling Colt to stop when the first bobbin was full, I didn’t have to tell him again when to stop. Even at the age of 3 he connected the sound the machine made when the bobbin was full and that when the spinning stops that means it is full. As the bobbin neared the full stage, he slowed his foot pedal actions down much like we would do with gas pump when trying to stop at a certain amount. Auddie missed the bobbin threading exercise, she was busy playing in her pretend kitchen. She wanted to sew alongside me, so I pulled out the vintage toy sewing machine Bobby recently won at an auction. The vintage sewing machine Bobby bought was identical to the one I had as a child except mine was light blue on the bottom instead of green. It only cost a couple dollars and came in its original box with the instructions. I had to makeshift a spool holder for the top with a replacement part from my old sewing machine, but it worked perfectly. If your town or county has a Facebook online auction page, check it out. We find great deals on both necessary and fun items on our county’s page nearly every week. There is also a page for our county and the three surroundings county’s, for livestock breeders to post their animals for sale and for customers to post what they are looking to purchase. 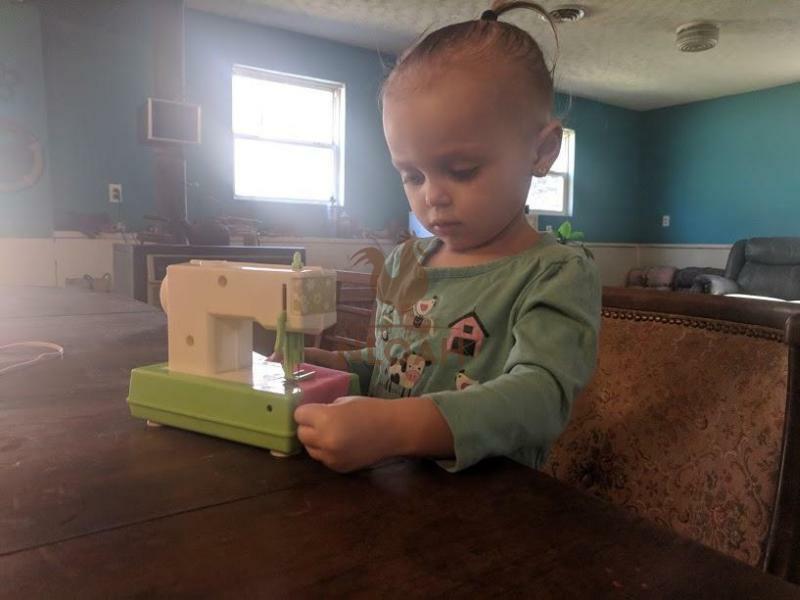 Yes, that is a real needle in the child’s sewing machine. I taught Auddie that it was sharp and how to place her fingers and the fabric so she does not get pricked by the needle. I drew some lines onto scrap pieces of fabric so Auddie could practice lining up the pieces and practice following directions while enhancing her hand and eye coordination. 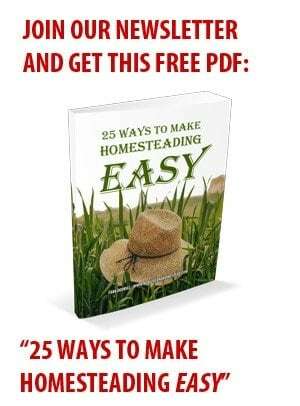 There are so many teachable moments on a homestead. I have vowed to always try my hardest never to miss a single one with all of our grandchildren and the other kiddos who happen over to visit with their families. Too many children in America now suffer from “Nature Deficit Syndrome.” That condition might not be listed in a doctor’s desk reference manual, but it is a very real and sad conditions. Sitting around playing on a computer game console, scanning social networks to check how many “likes” your latest photo received, does not a proper childhood make. Losing touch with nature and human interaction is going to reach its boiling point before too much longer in our great country…crisis level is likely right around the corner. These two lovely little ladies stopped by for a brief visit with their mother on Sunday. The oldest girl eagerly asked me, “Can we climb your hill,” in about the most excited tone ever. You would have thought she was asking to go to Disneyland or to have ice cream for breakfast. I of course told her to go right ahead and explore any part of our homestead her mom felt was safe for them to do so. 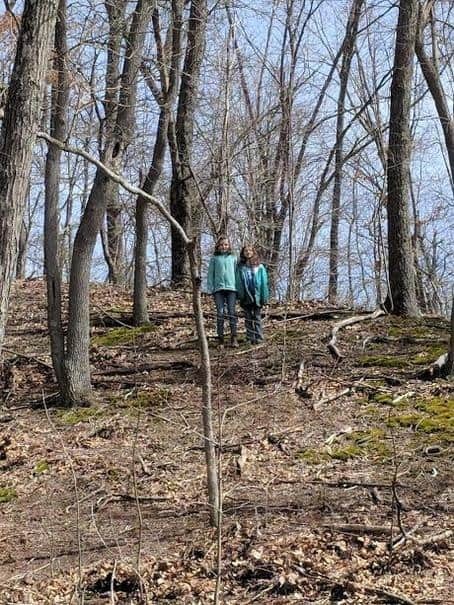 This was just a little hill behind the chicken coop, but the girls smiled with pride when they got to the near top and turned around to check out the view over the barn. THIS is how children should be spending their afternoons, not sitting inside tapping away at one technology device or another. Love the story about the goats. The pictures of the creek and road are crazy! Great post, thanks for sharing! 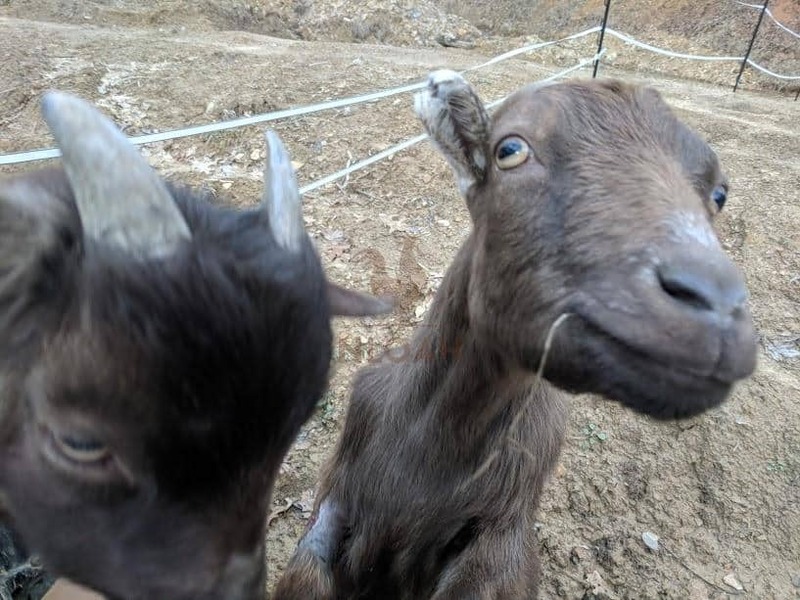 Thank you, my goats sure are ornery cuties. They just wandered into my open back door a few minutes ago trying to talk me out of an extra snack. I obliged and then quickly ushered them back out of the door before my hubby got home, for some reason he doesn’t like when the goats come in the house. They have been in here about a 100 times now and have never once made a mess on the floor. I think when I let Pearl jump up on the leather couch and take a nap with the dog and Bobby saw it, that was his breaking point, lol. I figured what’s the real difference between a set of muddy (I am saying mud but I am sure we track plenty of other stuff in on all our feet from the barn too) paws and muddy hooves..I mean really?! Is the homesteading kids curriculum up and running yet? We are so excited to see it! Thank you for sharing your adventures with us, so glad everyone is safe. Everyone got a bit muddy, but safe! 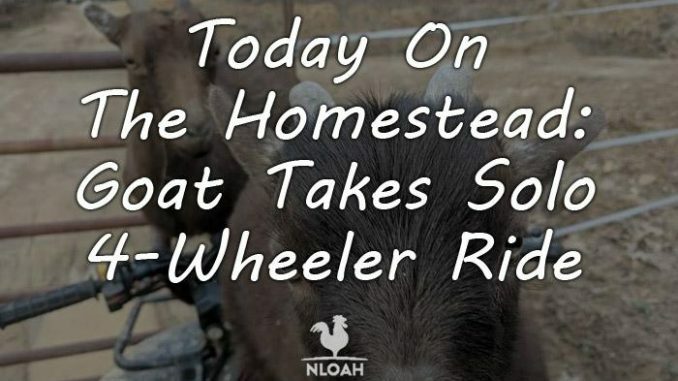 Life on a homestead is never boring! Not quite yet, I keep tweaking it, but soon. I am glad you are excited to see it, I will post a note to you here as soon as it is all up and running, I may go ahead and publish it one grade level at a time over the course of several weeks so I can make sure each is just right – well just right for now, and will keep adding to it.